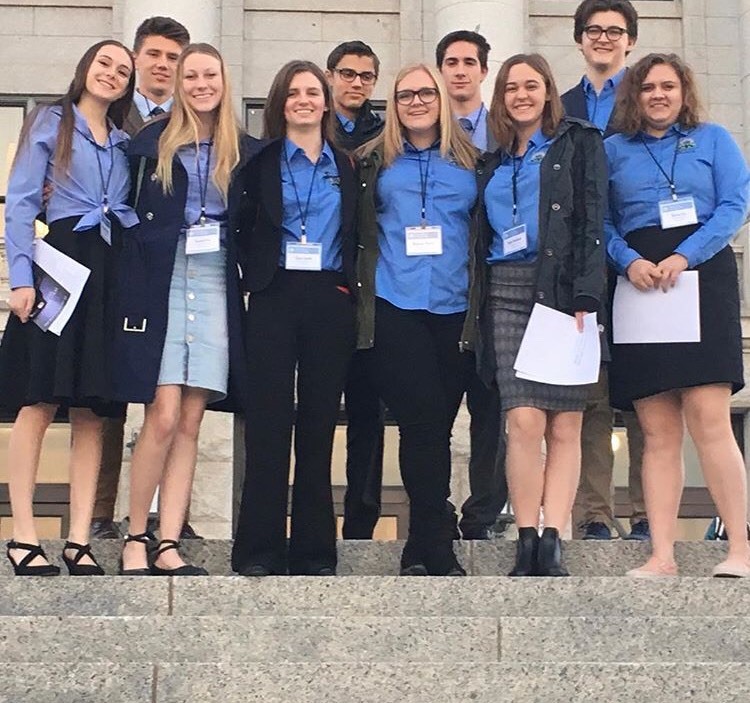 ST. GEORGE — After a year of community service projects and fundraising, the St. George Youth City Council is preparing to attend Local Official’s Day in Salt Lake City to tour the state Capitol and participate in a mock legislative debate. The council is composed of 17 middle school and high school students interested in representing and advocating for youth to local government and running community service projects. Each year the group attends Local Officials Day in Salt Lake City. The event is an opportunity for local officials from towns all over the state to gather and discuss the upcoming legislative session, which will have just begun Jan. 28. “I think it’s very helpful in kind of educating them on things and helping them to learn how they can be not only better citizens, but potential future leaders,” St. George Mayor Jon Pike said. Youth city councils from all over the state attend the event to meet legislators, be recognized and attend a formal luncheon with motivational speakers. Two councils have the opportunity to participate in a mock debate of a current bill. “It’s kind of interesting to see how we vote in the mock debate and then how the legislators vote,” Dixie High School senior and Youth City Council Mayor Weston Seegmiller said. The St. George group has participated in the mock debate for the past seven years and has been selected to do so again this year. This year’s Local Official’s Day is Jan. 30, and the students will hear from Gov. Gary Herbert, Clint Betts, executive director of Silicon Slopes, and Pike, who is this year’s president of the Utah League of Cities and Towns, over lunch at the Salt Palace Convention Center. Pike will speak about the legislative session and the importance of having city officials involved in legislation. “It’s really a great way to start off the legislative session each year,” Pike said. St. George Youth City Council members will arrive in Salt Lake City the evening of Jan. 29 to tour the Capitol, and will leave the evening of Jan. 30 after Local Officials Day events, missing just one day of school. “Being able to go to the state Legislature and the State Capitol and seeing all of that, it has opened my eyes more so I focus more on current legislation,” Desert Hills High School senior and youth council City Manager McKayla Pierce said. Throughout the year, the council takes on a minimum of one community service project per month. 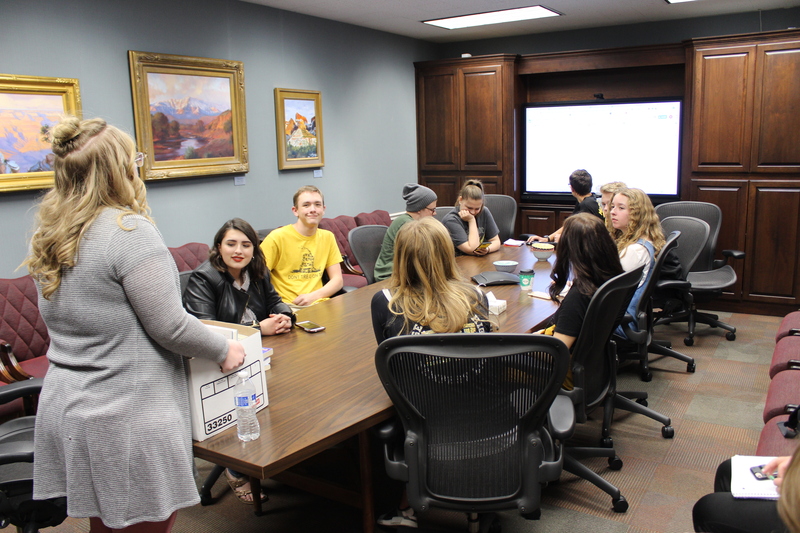 Each student on the council has the opportunity to chair a project and form a committee to help execute the event. For its most recent service project, the council held a clothing drive by placing boxes at local high schools, City Hall and the City Commons to donate to Switchpoint. Council members also raised $470 toward the $1,000 needed to attend Local Officials Day by holding a car wash fundraiser at Red Cliffs Mall on Nov. 10. The rest of the money needed will come from local sponsors. The youth council presents to the St. George City Council on several occasions throughout the year. At the beginning of the year they hold a banquet to discuss their plans for projects, which they then present in front of City Council. At the end of the year they debrief the council on what they accomplished. The city provides funding for the youth council. Self-directed budgeting and project management teaches the students valuable skills and bolsters their resumes and college applications. “What I found is that these students learn skills not only that they’ll use in college, but they learn skills that they’ll use in business,” council adviser Della Lowe said. Skills that the students pick up include communication, problem solving, budgeting, project management, teamwork, responsibility and leadership, Seegmiller said. “I think that those don’t just apply to what we do on the Youth City Council but they apply to life. … To be able to learn those skills is kind of without price,” he said. The council starts recruiting for next year’s members in January. The application can be filled out online, and the council will evaluate each application and interview those who qualify. The application is open to middle school and high school students who are residents of St. George. Those who live in surrounding communities may be selected if there are not enough qualifying St. George residents. Applications are accepted through the third week of March and those who are chosen begin shadowing current council members in April. The Youth City Council relies on community support and sponsors for much of its work, including fundraising and donations for community service projects and for their annual trip to Salt Lake City. Those who wish to make a donation can do so by check to the St. George Youth City Council at St. George City Hall at 175 N. 200 East, St. George. While they are there, can they ask our leaders why there is no separation of church and state? Maybe the STG city council can go too? Hopefully, it will be eye-opening enough that they’re inspired to get involved and help remove the people we have now. Lord knows the current legislators are completely out of touch. Utah needs to progress. They’re not out of touch. They’re perfectly in touch with their bank accounts. They know all the little perks of the job ($$$) come from developers. It’s like a miniature version of DC. Just adorable.